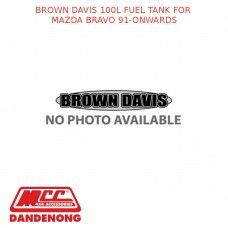 Description:BROWN DAVIS 4 PIECE SET UNDERGUARD MITSUBISHI PAJERO SPORT 15 PRESENTBROWN DAVIS U.. Description:BROWN DAVIS PRIMARY (PRE) FILTER KIT FOR TOYOTA LANDCRUISER - 79 SERIES DUAL CAB (2012-P.. Description: 100 LITRE REPLACEMENT LONG RANGE FUEL TANK TWIN CAB | SUPER CAB 4WD .. Description:100 LITRE REPLACEMENT LONG RANGE FUEL TANKEXTRA CAB PLUS 4WDThis tank is designed as a f.. Description:100 LITRE REPLACEMENT LONG RANGE FUEL TANKTWIN CAB | SUPER CAB 4WD This tank is des.. Description:100 LITRE 215MM FUEL TRAY TANK LONG RANGE FUEL TANKDUAL CAB.. Description:100 LITRE REPLACEMENT LONG RANGE FUEL TANKCREW DUAL CAB | 2WD | PETROL This tank is.. Description: 100 LITRE REPLACEMENT LONG RANGE FUEL TANK CREW DUAL CAB | 2WD | PETROL This.. Description:100 LITRE TRAY TANK LONG RANGE FUEL TANKThe Brown Davis Tray Tank range is designed to.. Description:100 LITRE AUXILIARY LONG RANGE FUEL TANKTD5 DUAL CAB MODELS WITH PLASTIC STANARD TANKFIT.. Description: 100 LITRE AUXILIARY LONG RANGE FUEL TANK ALL MODELS This tank is designed as a ful.. Description:100 LITRE REPLACEMENT LONG RANGE FUEL TANKDUAL CAB AND SINGLE CABThis tank is designed a.. Description:100 LITRE REPLACEMENT LONG RANGE FUEL TANKFREESTYLE EXTRA CAB This tank is designed as a.. Description:100 LITRE REPLACEMENT LONG RANGE FUEL TANKTWIN CAB | SUPER CAB 4WDThis tank is designed .. Description:100 LITRE TRAY TANK LONG RANGE FUEL TANKDUAL CAB STYLE SIDE MODEL .. Description:100 LITRE 215MM FUEL LONG RANGE FUEL TANKDUAL CAB.. Description:100 LITRE REPLACEMENT LONG RANGE FUEL TANKRN/LN46 TWIN CAB 2WD This tank is designe.. Description:100 LITRE REPLACEMENT LONG RANGE FUEL TANKALL MODELS 2WD This tank is designed as a..